It’s a small joint tucked away near Viman Nagar Avenue. The french fries are made in a completely unique way and for someone who is used to bland simple fries from McDonald’s, this ones sure going to surprise you. There were various options of french fries available, from chicken to sausage to BBQ cheese, topped with an assortment of various sauces and lots of cheese. There are great options for vegetarians too. Adding to the awesomeness, you can be adventurous and build your own supreme fries that leave all the other kinds of fries behind. The fries are served in a cone and might look like they’re not enough but are quite heavy and a task to finish. They also serve milkshakes and ice teas to accompany the fries. 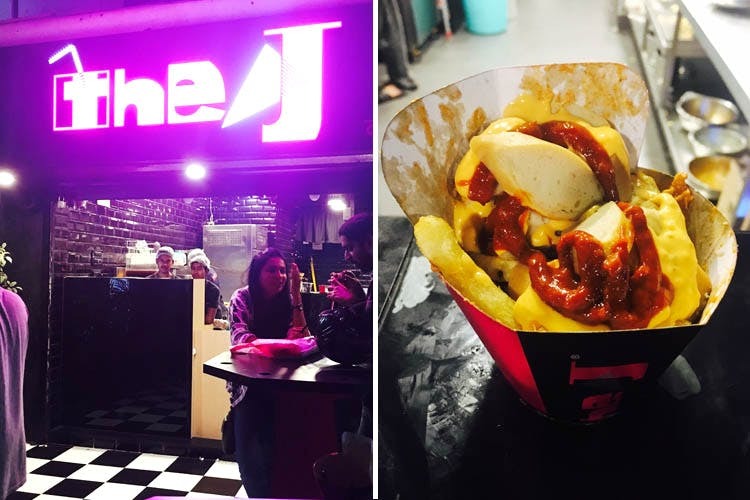 The place is quite small with only two tables and is mainly designed as a takeaway joint but the tables have holes in them where you can place your cones and have a conversation with your friends when there isn’t as much rush. The person at the counter is polite and the service is extremely quick, with me having to wait just 10 minutes for my order. The entire experience was quite cheap, with vegetarian fries costing a maximum of 150 INR whereas non-vegetarian fries cost a maximum of 160 INR. The place is pretty packed on weekends and standing and eating there can be uncomfortable so a takeaway order would be a good idea or else you can visit it on a weekday.